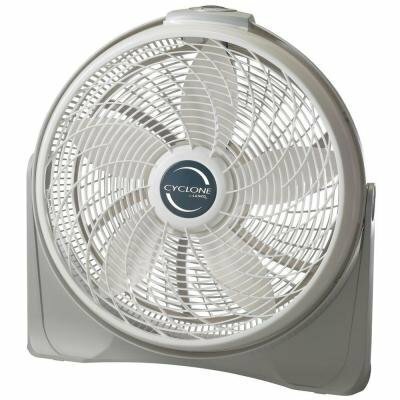 The 20" Lasko Cyclone Power Circulator Fan is a great choice for an all-purpose floor fan. This Lasko Cyclone Fan is a great addition to your air conditioning or can be directed at you for immediate heat relief. The 20" Lasko fan has three whisper-quiet, powerful speeds. Aerodynamic fan blades and a special grill design maximize the performance of this Lasko Cyclone Fan. Its adjustable fan head pivots 90 degrees, and locks in place for precision comfort. Your 20" Lasko Cyclone Power Circulator Fan is portable and easy to use with controls located on top of its easy-carry handle. Safety features include a patented fused plug cord set. Energy-efficient operation and fully assembled delivery add to the benefits of this 20" Lasko Cyclone Power Circulator Fan.